A famous journalism dean is found dead at the bottom of a stairwell. The police suspect members of the faculty who had been engaged in a fierce quarrel with the dean — distinguished scholars who behaved like schoolyard bullies. When Meredith “Red” Solaris is appointed interim dean, the faculty suspects are furious. Will the beautiful red-haired professor be next? The case detective tries to protect her as he heads the investigation,but new threats lead him to believe that Red is the next target for death. The story starts out with a real punch. Reminding us of a true story of a faculty meeting at the University of Alabama that came to an abrupt halt when one member stood up and shot 6 people, 3 who died. Meredith “Red” Solaris was starting to wonder if something like that could happen at her school, Mountain West University. The debates were getting more vicious than ever and the staff is clearly turning against each other. When she receives a call telling her that her boss had been found dead at the bottom of the marble stairs in the school she realizes it can and one of her colleagues could be a murderer. Borne Morris takes us behind the scenes of the School of Journalism at Mountain West University. The politics, the backstabbing, the crazy world where tenure is coveted and scorned when it leaves bad professors in the classrooms. We learn about cheating and plagiarizing, curriculum debates and student/faculty relationships. Sometimes this world drives people over the edge and people end up severely hurt or even dead. There is a lighter side of the story with a bit of romance between “Red” and the detective investigating the dean’s death. He is also doing his best to keep her safe. This was a very quick read. The content completely held my interest and rang true as this crime was not solved in a short period of time. The lead detective was even asked to let another detective look at the case with fresh eyes. Maybe Detective Joe Morgan had grown to close to the case to see the clues clearly. There was a variety of ways this story could have played out and there were the right amount of twists to have it make complete sense as everything fell into place. 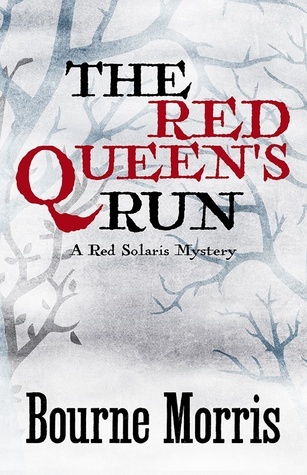 I think we have just scratched the surface of what we know about “Red” Solaris and Detective Joe Morgan. Morris has given us some rich characters here and she has left them plenty of room to grow. Find out more about Borne Morris on her webpage here. My J school was never this exciting! OK, I went back in the stone age – graduated college in 83 … This sounds really intriguing and I’m going to have to check it out.